While attitudes toward interethnic friendship can give an idea of how people feel about others in their personal lives, the Caucasus Barometer survey probes further into core beliefs by asking about attitudes toward interethnic marriage. In analyzing their replies, we gain an insight into how different ethnicities come into play in the context of marriage and the formation of a family. Because the family as a unit makes up the traditional conception of a society as such, typically attitudes toward interethnic marriage are more conservative even when interethnic friendship is accepted. This holds to be true in the case of the Caucasus countries according to the CB 2009 data. In addition to the question about approval of interethnic friendship, the same question was asked about approval of a woman of one’s ethnicity marrying someone from these same groups. When compared with the findings of the question about friendship, all three countries have majorities of respondents disapproving of marriages outside of their ethnic group or nationality. The one surprising exception is a narrow majority of Armenians – 51%—approve of Armenian women marrying Russians. Georgians are less than enthusiastic about interethnic marriage, but still more so than their Armenian and Azerbaijani counterparts. With the Armenian-Russian exception, Georgians have relatively high approval levels for Italians, Greeks, Russians, Americans, and Germans, between 37% and 41% viewing such mixed marriages favorably. Marriages with Abkhazians and Ossetians both fared comparably to those with Europeans; both had 36% of respondents approving. Armenians are also disapproving of inter-marriage, except for a narrow majority of 51% approving of Armenian-Russian marriages. Armenians are slightly less accepting than Georgians, but also without dramatic drops in approval of marriages with many European groups, which had more than 30% approving of mixed marriages with Europeans. 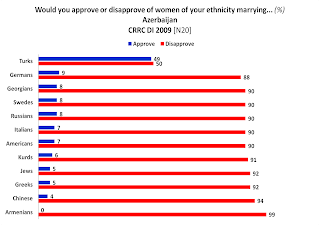 Azerbaijanis are the least supportive of friendship with other ethnicities, so it is also not surprising to observe the highest levels of disapproval of Azerbaijani women’s marrying men of other ethnicities. Only 49% approve of Azerbaijani women marrying Turks, compared to 82% approving of friendship. The other ethnicities that a majority of Azerbaijanis approved of friendship with – Germans and Russians—fared dramatically worse on the question of marriage, having only 9% and 8% approving respectively. Ninety-nine percent of Azerbaijanis looked unfavorably on a mixed Armenian-Azerbaijani marriage. Marriage and subsequently family ties are far more personal than a simple friendship – marriages yield children, and children are the future of every nation. Changes in the traditional conception of a national identity based on ethnicity is perceived as a threat to the survival of the nation in its present form and this may be an explanation for the significant drop in approval of ethnically mixed marriages from friendship in the South Caucasus. Yet what is the relationship between approval of such friendships and marriages? How far does ethnic identity play a role in the shaping of such attitudes? What are the factors that could influence more tolerance toward interethnic bonds? Tell us your opinion by posting a reply! Click on the charts for a clearer view, and access our data here.